Social Media Optimization forms an integral part of digital marketing. Platforms such as Facebook, Twitter and Pinterest form the core outlet of spontaneous dialog between companies and customers. 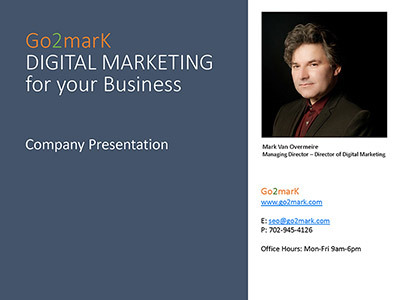 Go2marK focuses on streamlined social media campaigns with measurable results. Social media advertising is a great addition to maximize return on investment. We recommend using Facebook, Instagram, and Twitter to promote your products or services. We recommend using Facebook to engage with consumers. Facebook is the ideal platform for your targeted audience group of females between 20 and 80 years of age. We will manage and optimize your Facebook page. Your Facebook page will be of great value when we start using Facebook Ads. To increase awareness, we will make a number of posts per month and boost the ones that are important for maximum impact. The total number of posts depends on the available budget for the project. Instagram is a wonderful visual social media platform where pictures and videos are posted and shared with followers. Because Instagram is so visual it is fast and easy to use. We recommend using Instagram if your audience group are females between 20 and 50 years old. Twitter is one of the most powerful social media platforms for businesses. It can be used as a communication platform, for customer service, for releasing the latest news about a product or service, etc. Although Twitter might not be the ideal platform for your product we do recommend that you set-up a profile with them and make regular tweets.